Back in the day in the UK, these were fun machines, albeit, people want the faster RD400, the XS was a great machine and had a style unique of its own, I do not see many here in Orange County these days and this would make a fun Brat bike if you located an old rusty relic and this is what the Australian fella has done with this great ride. 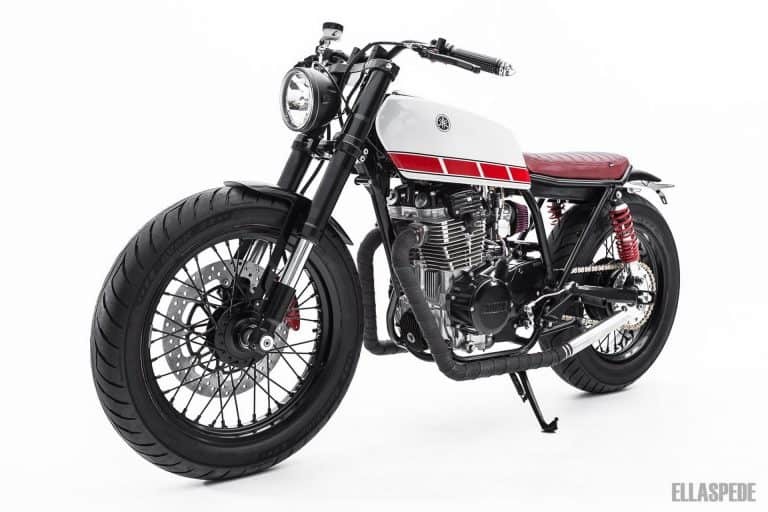 Ellaspede is a great Motorcycle fab shop based in Brisbane and when Dan approached them for this build, they were all in and knew what they wanted to do to give their Customer the Cafe/Bobber styling that is quite the trend Globally right now. 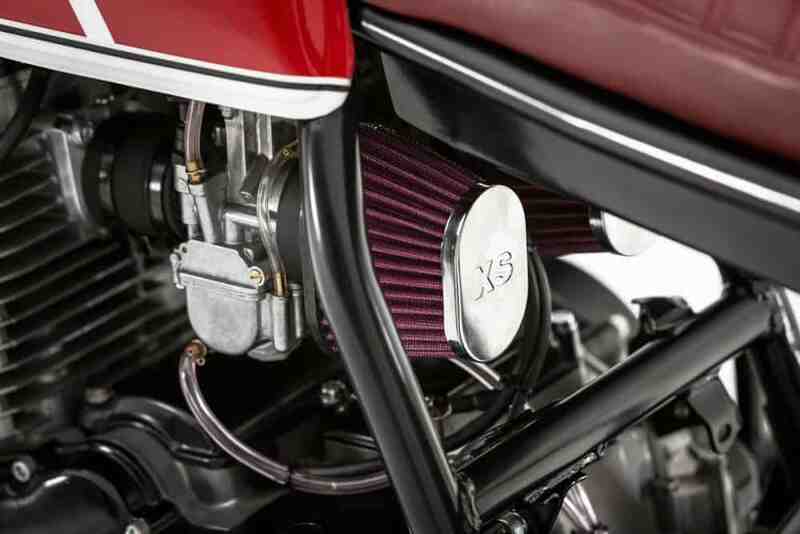 The drive train is a refreshed 392cc motor but new Crank, Piston and rebuilt carbs, this breathes well through home made smaller header tubes and custom mufflers that have a 22 degree angle and then wrapped in DEI Titanium heat wrap. I love the way this machine sits and the Aprillia RS125 front end looks like Factory and I am certain it will handle 100% better than the stock telescopic front end ever did. 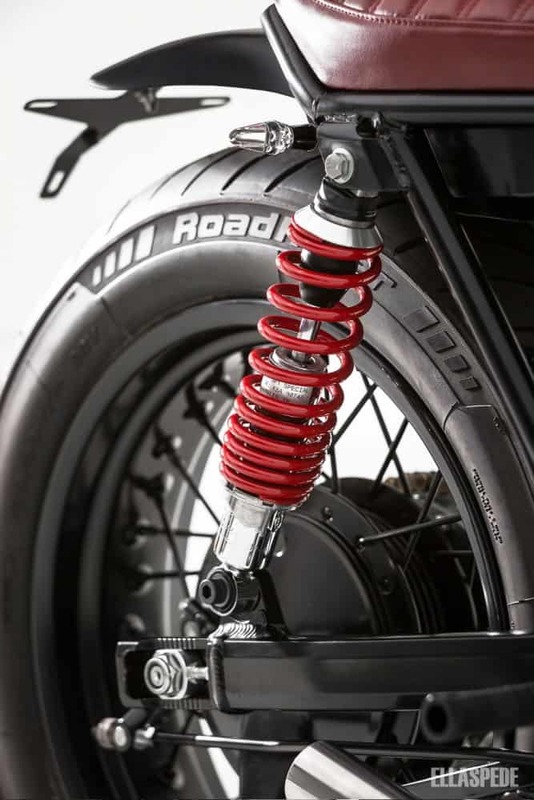 With a Brand New set of Ikcon 7610 shocks, really makes this an all round smooth ride, SR500 rear end and the wheels are shod with a set of Avon Road Runner Tires, keep this Yamaha on the Tarmac. 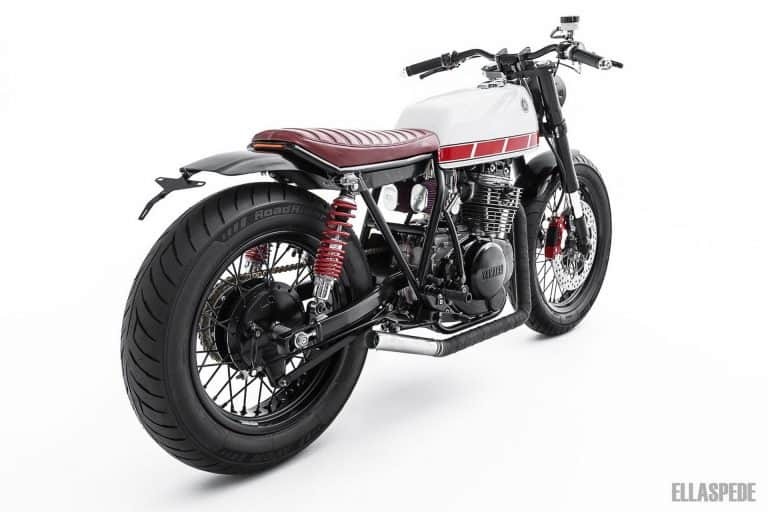 Chopped front fender and unusual fitting of the brake Rotor to the right hand side, makes this 400 machine stand out on the crowd, The Smaller 5-3/4 headlight sits well and balances the front end of this creation. 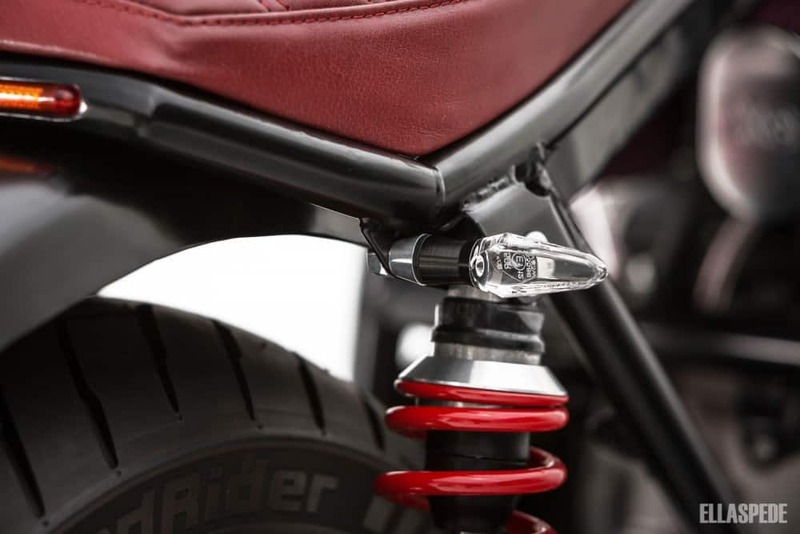 As for electronics, it has been equipped with Motogadget products such as the m-Unit control box that simplifies the wiring, the m-Blaze turn signals , the Mini Motorscope Mini Gauge marker , the m-Grips and the small m-switches . The brake-position light has been integrated into the chassis. 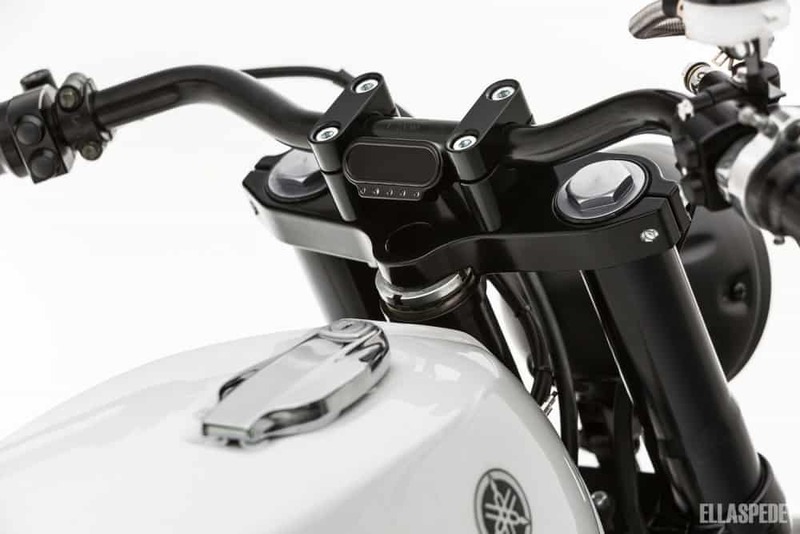 The wiring has been simplified, isolated and hidden through the handlebar. An Antigravity lithium battery powers the system. 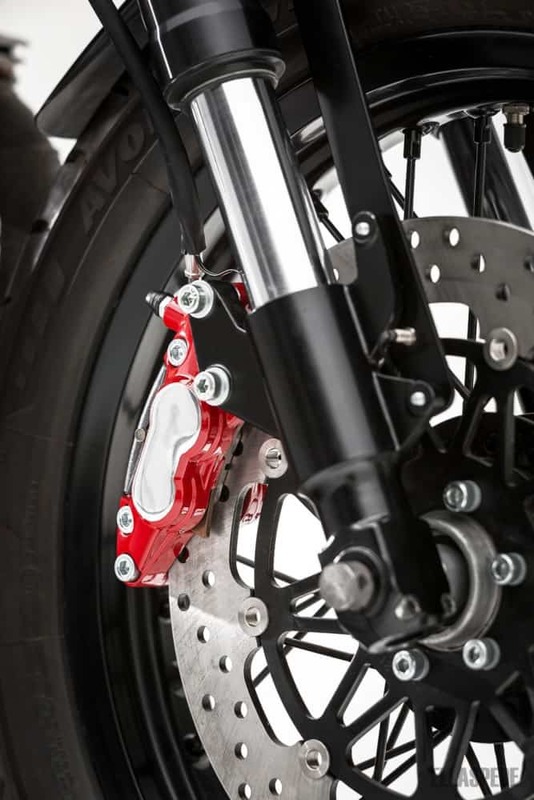 For the boot system, it uses the Motogadget m-Lock RFID , which makes it possible to dispense with the original key. 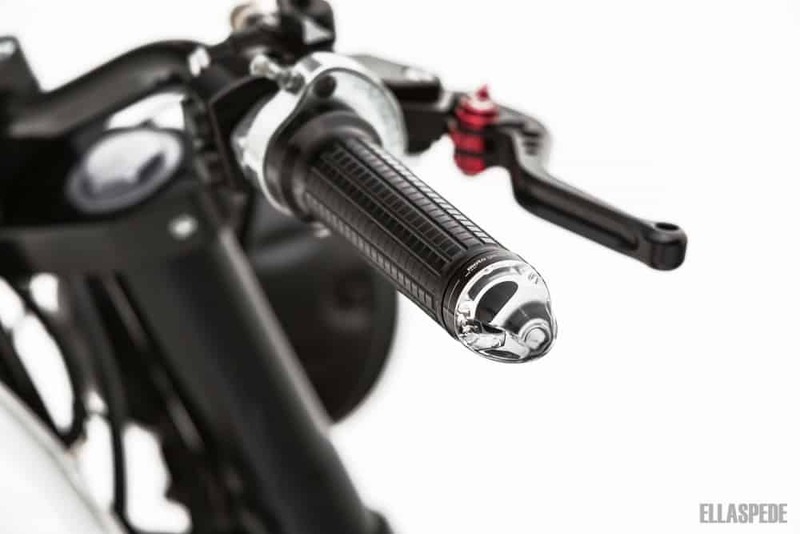 For the controls have been added adjustable handles, a Tommaselli accelerator and a low-rise LSL handlebar . 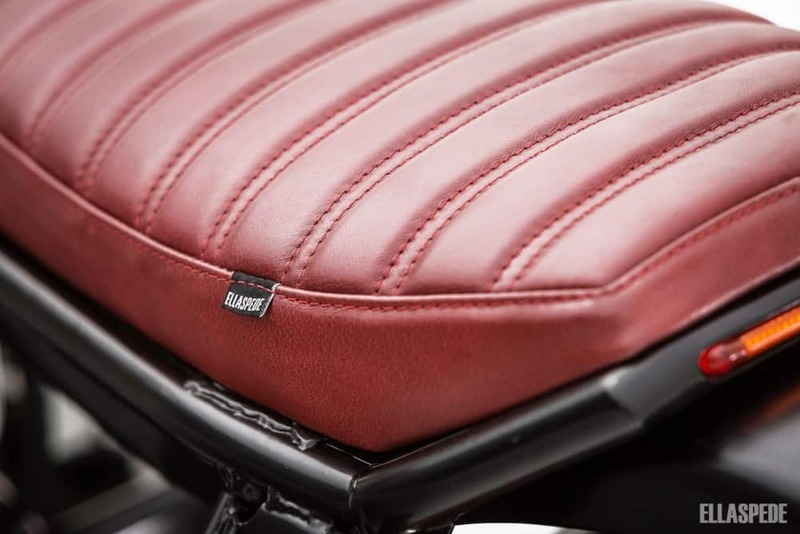 The seat made of high intensity foam has been adapted to the new shape of the subframe and finished in a dark leather. A really well build machine and this 1977 Classic has been resurrected into a fun motorcycle and am happy to share this build with you this morning. 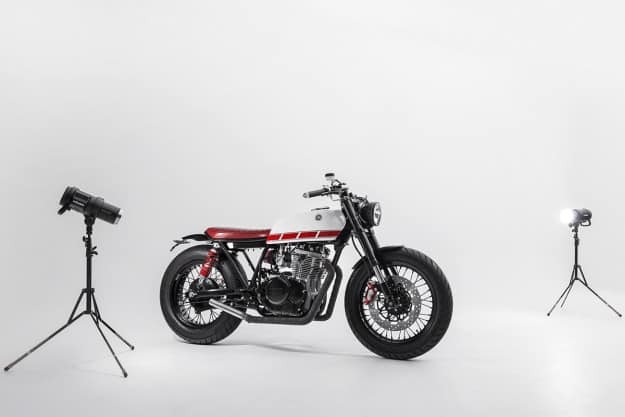 Super wide bars, Moto gadget switches and a very clean front end will make sure this bike will turn many heads where ever it is parked up, I really like this bike and am sure it will get a lot of publicity as it deserves it. 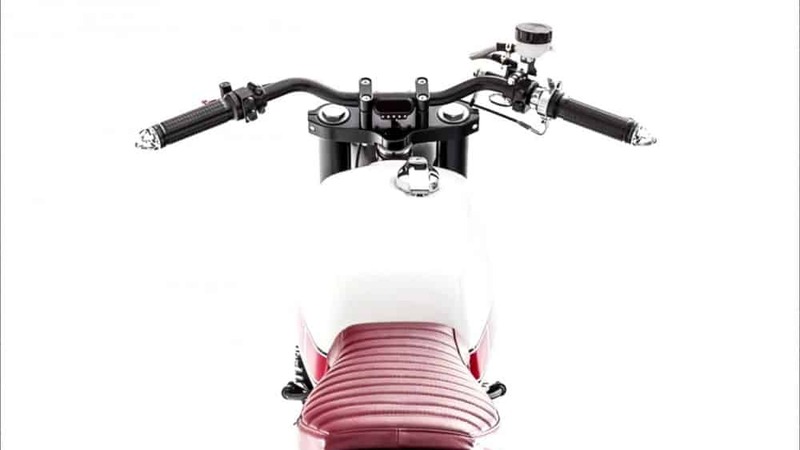 Perfect stance and I bet this sure is a blast to ride, the riding position is bang on and a refreshing creation that works at every angle too. XS Pod Filters fitted, Flat slide performance carbs now breathe through oval pod filters, ensuring there’s enough mixture going into the oversize bore.- and all electrical hidden away under the seat, makes for a really tidy chassis, hand made seat has traditional tuck n roll to finish off right. This bike was literally hiding for many years in a barn over in Northern Queensland and the Customer (Dan) was stoked to get this bike and find a company that was into transforming the bike into what it is now, they tried a few gas tanks, even an RD version but in the end, the stock tank had great lines, so why not use it and I am glad to say it works tremendously. From the front it only gets better, that Halo light shows the way with no worries at night and with adjustable levers and a Tommaselli throttle on LSL low-rise bars, well it is a really comfortable machine to ride anywhere to be honest. So much work to get the bigger rear end in and it was worth it, and with stainless hand made exhausts, well it compliments the craft of these guys down under. 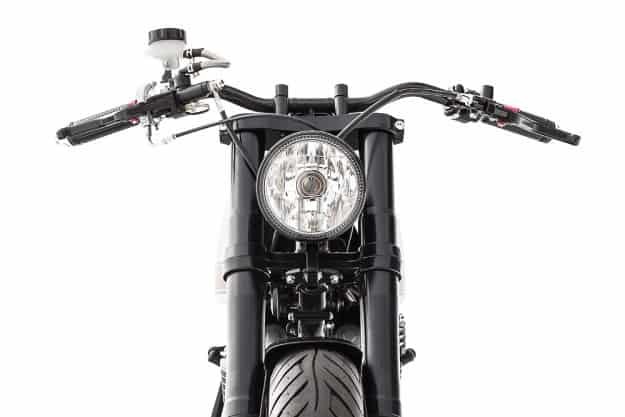 Motogadget Bar end signals make sure people can see where this machine is heading and just look how clean the front end is, albeit it would need a mirror over here. Having a comfortable seat looks to be impossible with some of the rides I see created these days, but no here, using high quality and density memory foam, this is lavishly applied to the hand made seat base, then for added Arse care, a gel insert was laid on top of the foam, to give your bum a Cadillac ride, then covered in an Ox Blood Naugahyde in the old school Tuck n Roll, this really finishes the bike off well. Hand made and double stitched, this looks like a factory made seat, a really nice job and a cool touch adding the companies name as a tag. 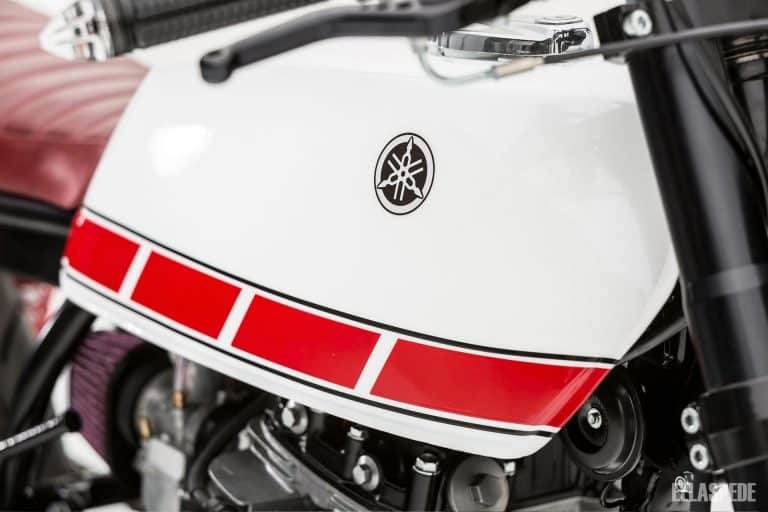 Below, the Aprillia front end sits so well and look at the gas tank, Yamaha Tuning Forks logo is reminiscent of them 1970’s racing days, as well as the red Blocking that Kenny Roberts would be proud of, actually turn out to be a Ducati Color RED and white pearl and it sure works very well indeed. At the rear things were a little more complicated given the new wheel width. 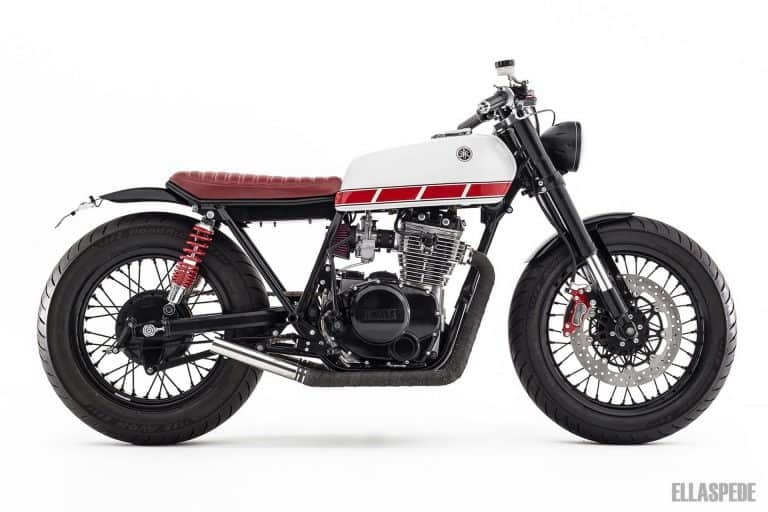 An aftermarket SR500 alloy swingarm provides some more room for rubber while matching the subtle angular aesthetic of the build. Custom spacers keep the new rear hub in place with offset adapters required to space both sprockets out for the re-specced 525 chain to clear the wider rear wheel. 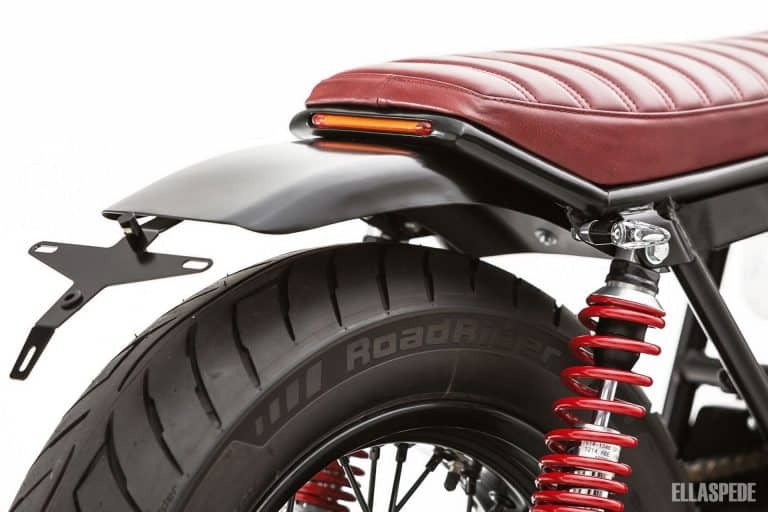 The bulky factory rear disc / caliber combo was discarded in favor of a compact Yamaha drum setup, which provided the required look and is braced via a custom dogleg linkage. 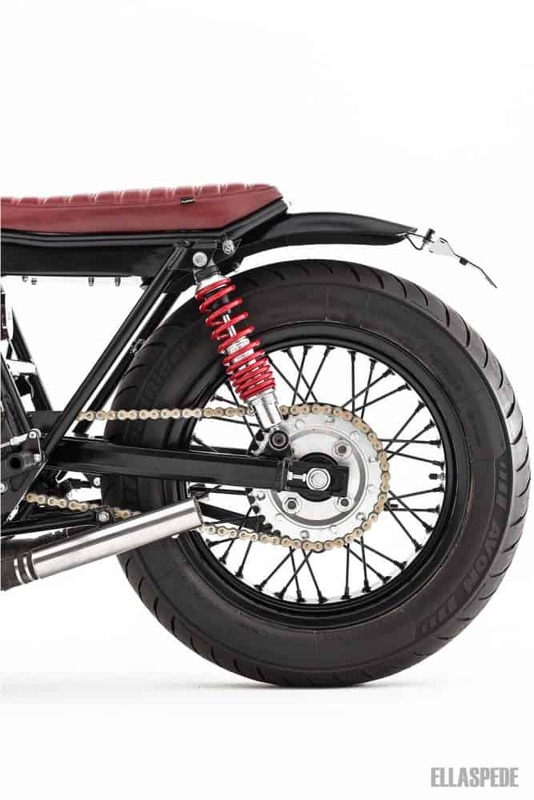 The rear brake actuator rod was also made to clear the wide rubber. The front rim was a reasonably straightforward fit with some custom axle and brake spacers bringing everything together. The factory Aprilia disc rotor bolted straight onto the Yamaha hub and the Aprilia name was machined off the brake caliper before being rebuilt. 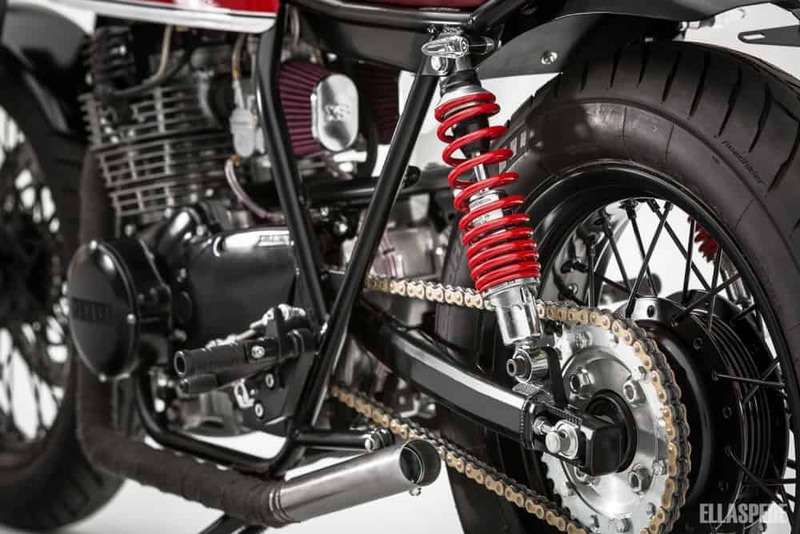 A aftermarket master cylinder and stainless braided line completes the front brake setup. 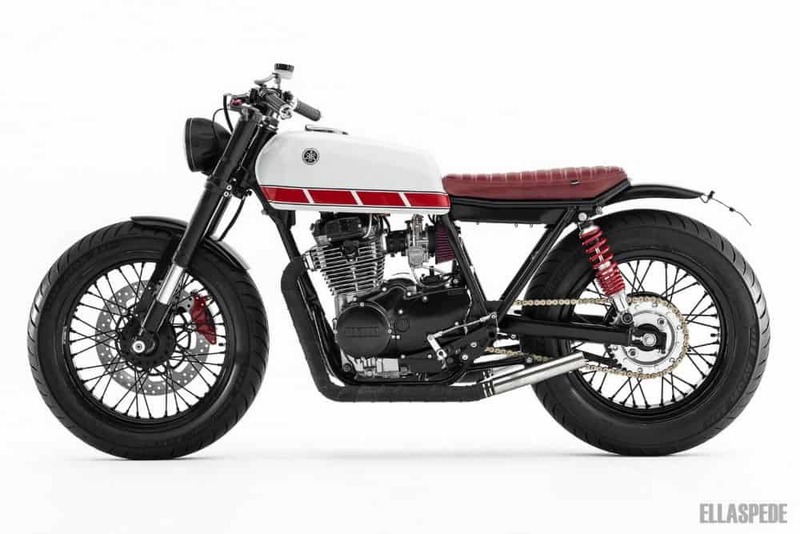 Thanks for reading my Blog today, its great receiving emails from people letting me know how it was and spreading the word on 2 wheeled creations. Have a great Friday and hope that you get some saddle time over the weekend. 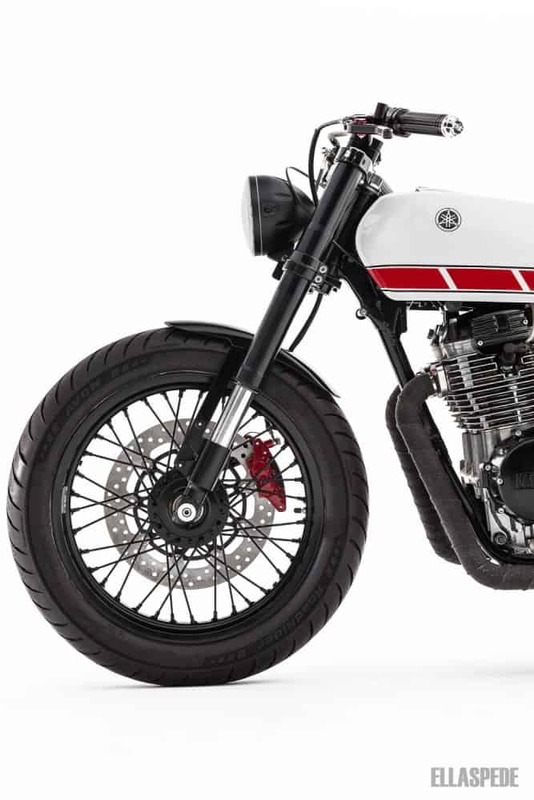 This entry was posted in Blog and tagged Antigravity, Aprillia, avon, brat, Brembo, custom, Ellaspede, Halo, motogadget, stainless exhaust, XS400 1977, yamaha.